Developer Marquette Properties has lodged a development application for a $13 million boutique residential apartment project in Newmarket. Designed by local architects Paul Fairweather and Tony Jemmott, The Garden Terraces comprises 26 two and three-bedroom residences set across a low-rise building form. Located six kilometres north of the Brisbane CBD and within 400 metres of Newmarket railway station, Marquette Properties director Adam Di Marco said the project was positioned to attract the three types of buyers who are driving real estate transactions in Brisbane – first home owners, downsizers and investors. 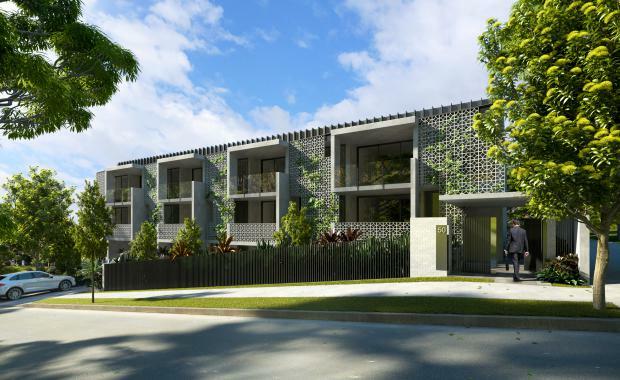 “With well-appointed and generously sized two-bedroom apartments priced under $500,000, The Garden Terraces is poised to meet the insatiable demand for affordable quality in the Brisbane middle ring,” Mr Di Marco said. “There’s a gaping hole in the market for developments that bring together thoughtful design, ease of lifestyle and value for money,” he said. The Garden Terraces is defined by its unique use of concrete breezeblocks to construct the building’s northern façade, whilst at the same time expressing an architectural form that captures the historical context of the suburb. The architects, designers and builders have combined to utilise the humble building material which was used for decades as a cheap and cost-effective treatment. “In designing the facade, the developers challenged us to reinvent our understanding and application of the breezeblock material. They wanted us to flip the product on its head and reimagine it,” Tony Jemmott of Jemmott Associates said. “We were inspired by the use of breezeblocks when we walked the neighbourhood. It was equal parts defining and unassuming, and we decided very quickly that the breezeblock was to be the central design element of The Garden Terraces,” Mr Di Marco said. Place Design Group have prepared and lodged a development application on behalf of the developer with approval expected in late 2016. Marketing of The Garden Terraces is expected to be released once approval is granted.